India celebrates a number of Hindu New Year Days in the month of March-April. It corresponds to Chaitra (Chet), the first month according to Hindu calendar. After celebrating Ugadi (Telugu and Kannada New Year), Cheti Chand (Sindhi New Year) and Gudi Padwa (Marathi New Year) earlier this month, we now head to Puthandu 2019 (Tamil - தமிழ்ப்புத்தாண்டு) or Tamil New Year celebrations. 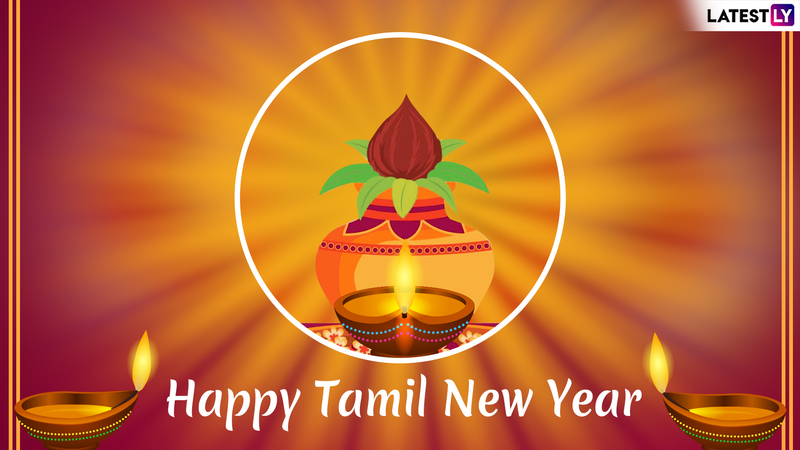 Tamilians living in the state of Tamil Nadu or outside wish each other by saying Puthandu Vazthukal that translates to ‘Happy New Year’ in Tamil. 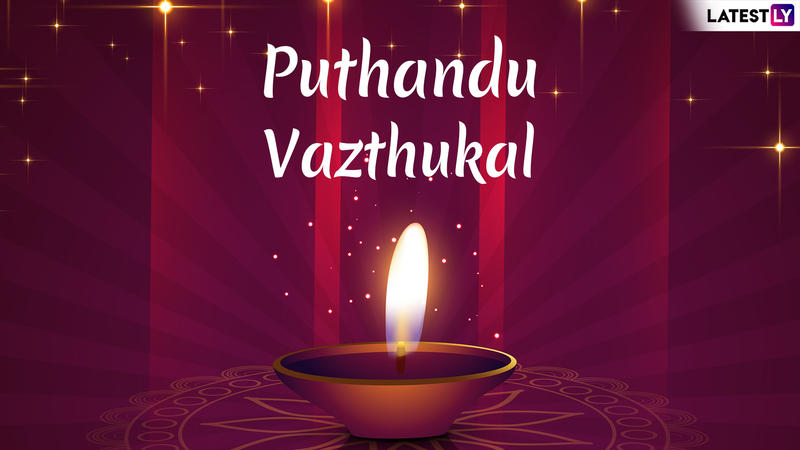 While we have already shared multiple articles on wishing Happy Puthandu in Tamil and English, we now bring you a collection of Puthandu Vazthukal images, HD wallpapers, Chithirai Puthandu images, GIF greetings and WhatsApp Stickers to wish Happy Tamil New Year 2019 to your near and dear ones. Happy Puthandu 2019 Wishes: WhatsApp Stickers, Messages, Puthandu Vazthukal GIF Images, SMS & Photos to Send Tamil New Year Greetings. 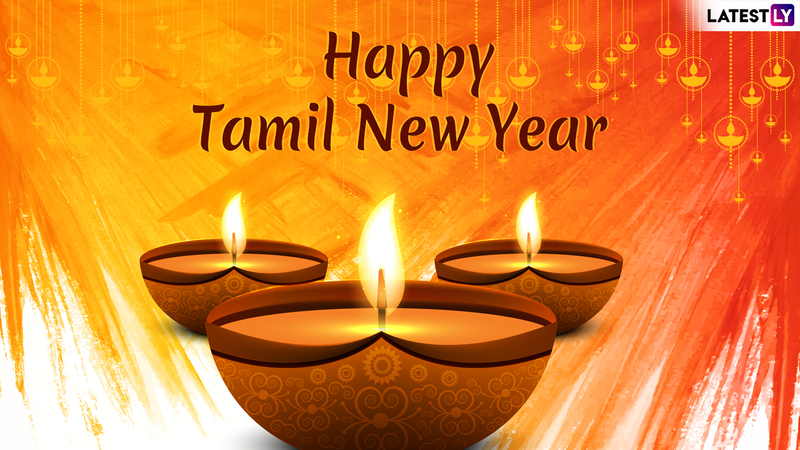 Puthandu is the first day of the year on the Tamil calendar, sidereal Hindu calendar used by the Tamilians. As per the Hindu mythical legends, Lord Brahma began the creation of the universe on the day. On this day, people wish each other by saying "Puttāṇṭu vāḻttukkaḷ!" (புத்தாண்டு வாழ்த்துக்கள்). There are many other ways to greet each other on Tamil New Year like saying "Iṉiya puttāṇṭu nalvāḻttukkaḷ!" (இனிய புத்தாண்டு நல்வாழ்த்துக்கள்) that is equivalent to "Happy New Year." If you are unable to wish your family or friends in person, you can always wish them online. 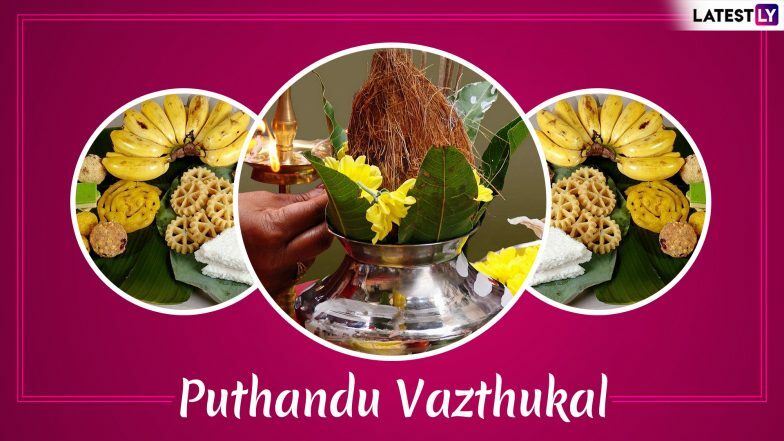 Or, if you are someone who may not celebrate Puthandu but have friends for whom Tamil New Year is a big deal, you can send them these lovely Puthandu Vazthukal images and greet them on the big festivity day. Puthandu 2019 Date: Know the Significance and Celebrations of Ringing in Tamil New Year. 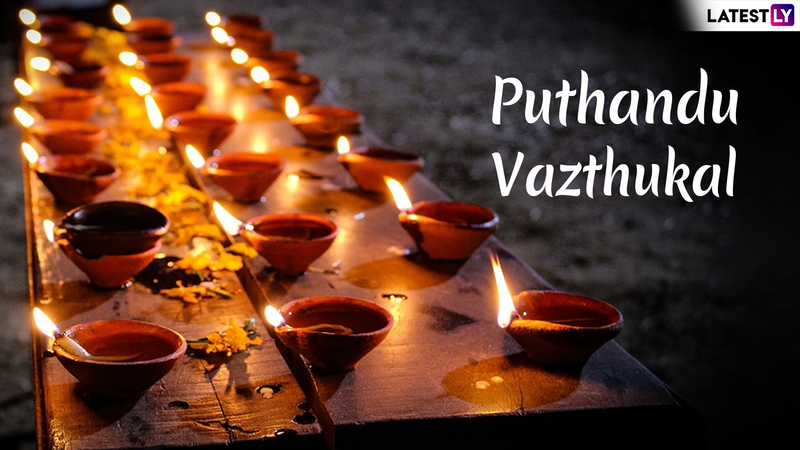 In this article you will find everything related to Puthandu Vazthukal 2019, Puthandu Vazthukal images, Puthandu Vazthukal wishes, Puthandu wishes, Puthandu greetings, Puthandu images for WhatsApp, Tamil Puthandu images download, Chithirai Puthandu images, Tamil New Year 2019 images, Tamil New Year 2019 wishes, Tamil New Year 2019 WhatsApp status, Tamil New Year 2019 greetings in Tamil, Tamil New Year 2019 quotes, Tamil New Year 2019 images HD, and more. Puthandu 2019 Wishes in Tamil: Facebook Greetings, WhatsApp Stickers, GIF Images to Celebrate Tamil New Year. WhatsApp Message Reads: You Have Made This Far, You Have Defeated Those Sorrows and Tears. Wishing You More Strength and Determination. May You Have a Great Puthandu This Time! Puthandu Vazthukal. WhatsApp Message Reads: On This Auspicious Occasion, May You Be Showered With the Divine Blessings of Happiness and Prosperity. Happy Puthandu! WhatsApp Message Reads: New Aspirations, New Hopes, New Dreams, It’s a New Beginning. May All Your Dreams Come True and Give You the Joy That You Always Wished For. Puthandu Vazthukal! WhatsApp Message Reads: May This New Year Bring Many Opportunities Your Way, to Explore Every Joy of Life and May Your Resolutions for the Days Ahead Stay Firm, Turning All Your Dreams Into Reality and All Your Efforts Into Great Achievements. WhatsApp Message Reads: Let This Tamil New Year, Brings a Lot of Cheer and Peace in Your Life. May the Divine Power Gives You Enough Strength for Tolerating Highs and Lows of Life With Calmness. Happy Puthandu! How to Download Puthandu WhatsApp Stickers to Wish on Tamil New Year? If you wish to send cute and colourful WhatsApp Stickers in addition to the images, greetings and messages, you can download a score of animated stickers from Play Store. The 'Tamil Puthandu' festive pack has everything from Tamil New Year GIF greetings to Puthandu Vazthukal 2019 WhatsApp Stickers. You can download HERE. Apart from Puthandu or Tamil New Year, April 14, 2019, will also see Hindu New Year celebrations in other parts of the country like Vaisakhi or Punjabi New Year. A day later, people will also celebrate Poila Baisakh or Bengali New Year, Bihu or Assamese New Year and Vishu or Malayalee New Year on April 15. We wish a new beginning, new hopes, and new horizons to reach. May the Sun radiate all the goodness of life in the coming year and always! Puthandu Vazthukal!